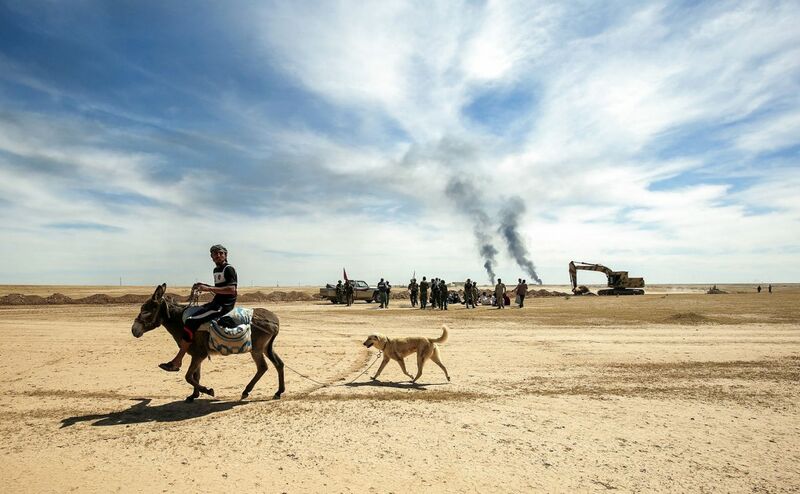 A diplaced Iraqi man rides a donkey, followed by his dog as pro-government Hashed al-Shaabi (Popular Mobilisation) paramilitary forces advance towards the UNESCO-listed ancient city of Hatra, southwest of the northern city of Mosul, during an offensive to retake the area from Islamic State (IS) group fighters, on April 26, 2017. Hatra is the latest important archaeological site to be recaptured from IS. Jihadists had embarked on a campaign of destruction against archaeological sites after they seized swathes of Iraq and Syria in a lightning 2014 offensive.